I spent the past two and a half weeks climbing in the southeast. I spent the majority of my trip at Rocktown, a sandstone area located in northwest Georgia. Rocktown is a maze of sandstone boulders spread out with many quality moderates. There are a lot of roofs at Rocktown and the camping is free. My goal was to finish a cool roof called Tractor Traylor(turns out I was actually climbing the extension). I came close to doing this climb 3 or 4 years ago, but then the jackass southern rain prevented any further efforts. There was a large bucket at the end of the roof, but when I returned this year it had been broken off. I think that it makes the problem significantly harder and more sustained. Every time it rained on this trip I had nightmare flashbacks that I was not going to be able to finish it, but I sent the day after xmas. I couldn't have got a better xmas present than that. I climbed several moderate classics including Rescue 911, Croc Bloc, Spice, The Tooth Problem, Pythagorean Theorem, Triple Slaps, Golden Showers, and Double Trouble. 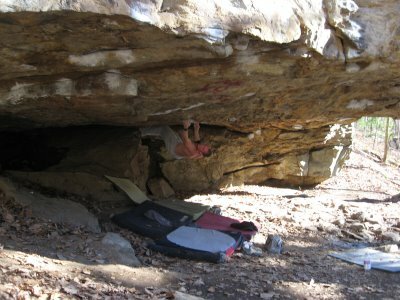 After Rocktown, I headed back to the Vapor Lock Roof at Dayton Pocket. This area is more or less a perfect example of my ideal climbing area. It's a short hike to the roof, there is a lack of crowds(I didn't see a single person all day), and the roof is massive with cool holds and pumpy climbing. I tried the crux moves of Honeycomb without high expectations, but I was able to do the moves. Apparently Tractor Traylor extension left me in great shape as I was able to do the climb in a few tries. I also did Torpedo which climbs cool rails out to a jug finish. I spent the last 2 days of my trip in the southeast climbing at some spots I had never been to. I visited LRC and climbed on some classic boulder problems. LRC is conveniently located close to Chattanooga and has a short hike. There is a large amount of sandstone boulders that host inspiring lines. The Wave was an awesome feature that started on jugs and climbed out a long sloper rail. Super Mario was another noteworthy problem that had fun movement, cool holds, and pockets! Tennessee Thong is an amazing boulder that has a somewhat blind throw to a massive jug. When I hit the jug my right hand came off and slapped against a wall to stop the barndoor. I haven't done a move as unique as that throw. I headed south to Alabama to check out HP40. I drove down there after climbing in the morning at LRC, and visited a small area located outside of HP called Sumatanga. There is a good roof problem there called Melodrama that climbs good edges and pockets out the roof. I did this problem, then camped at HP for the night. In the morning, I woke up to the sound of more southern jackass rain. It wasn't raining hard, but it was my last day before heading to Texas. This rain was odd in the sense that it was more of a fog that soaked the trees, which in turn rained on the boulders. Anything that was out in the open was dry, but boulders under trees were wet. It was the strangest form of wet that I've seen. I did a quick session of some of the steeper climbs including Hammerhead, Mulletino, and Short Long.